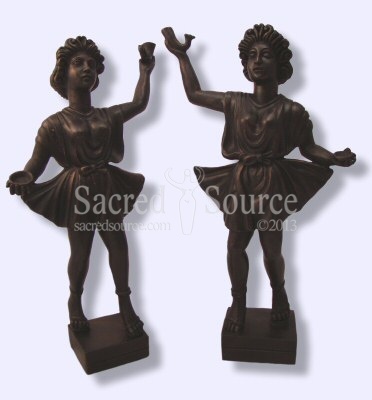 Sacred Source, produces statues and plaques, most based on historical pieces. All are of excellent quality. Sacred Source products are made in India. In their FAQ, Sacred Source says "[W]e can modify the finish or material of one of our existing statues for a relatively low additional expense. We are delighted to take on such challenges and have produced some amazing artworks in the past." Through a special arrangement Nova Roma citizens will receive discount of 20% off on orders of US$50 or more. Just visit the Sacred Source site. When you are checking out, enter "NOVAROMA" as the discount code. You will have to pay the normal shipping and handling costs. Items are shipped worldwide from Mediatlantica Provincia. Information on shipping rates is available. 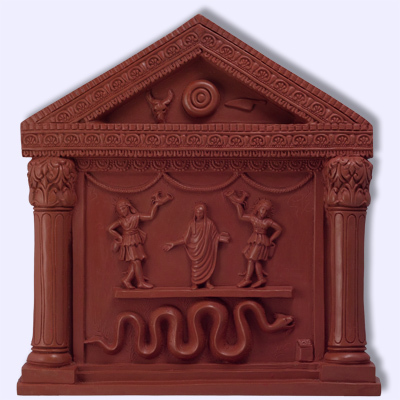 The images here are from the Sacred Source Greek and Roman catalog. The photographs are copyright © by Sacred Source and are used with permission. This page was last modified on 8 August 2008, at 13:31.